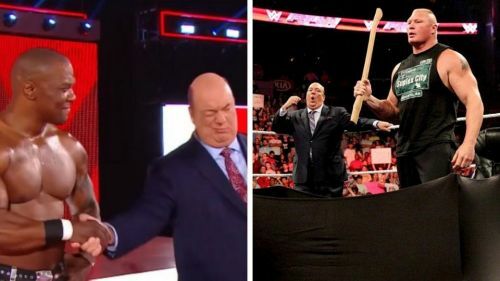 There have been a number of big hints that WrestleMania 35 could see Brock Lesnar's last WWE match. Brock Lesnar is currently the WWE Universal Champion, a title he's held since WWE Crown Jewel where he pinned Braun Strowman to win the vacant title. Lesnar is set to defend his title at WrestleMania 35 against the winner of the 2019 Royal Rumble winner Seth Rollins in what could be Lesnar's last match in WWE for a while. There are a swathe of rumors which suggest that Lesnar may not be signing a new contract with the WWE when his current one ends after WrestleMania 35. Lesnar would be a big loss for WWE, especially since Dean Ambrose also looks set to leave the company when his contract ends after allegedly refusing to sign a new deal. What does the future hold for Brock Lesnar? Are rumors of All Elite Wrestling's interest in signing Lesnar real or just rumors in the dirt sheets? We don't know anything for sure yet but there have been some signs in recent months that Brock Lesnar could be leaving WWE sooner rather than later. We begin with one of the biggest signs yet that Brock Lesnar could soon be leaving WWE. WWE SummerSlam 2019 comes from Toronto later this August, and WWE have already begun advertisement in the local markets. Guess who is conspicuously absent from all promotional material? Current WWE Universal Champion Brock Lesnar. Brock Lesnar is one of WWE's biggest stars which makes his absence seem to be more than an oversight. This could be another sign that Brock Lesnar may soon be ending his career in WWE to look at greener pastures elsewhere.